Is cúige iartharach de chuid Cheanada í Alberta; tá sí mar chúige ó 1 Meán Fómhair, 1905. 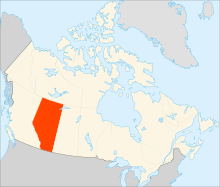 Tá Alberta suite in iarthar Cheanada, tá An Cholóim Bhriotanach ó thiar agus Saskatchewan ó thoir, Northwest Territories ó thuaidh, agus Montana, sna Stáit Aontaithe ó dheas. Is í Edmonton príomhchathair an chúige, suite sa lár (agus ó dheas). Solathraíonn Edmonton ola agus acmhainní eile an tuiscirt. Cathair an-tábhachtach is ea Calgary maidir leis an iompar, trádáil agus tráchtáil. De réir tomhais daonra, tá níos mó ná 1 miliúin duine de dhaonra ag an gcathair. I measc na gcathracha tábhachtacha eile in Alberta, tá Red Deer, Lethbridge, Medicine Hat, Fort McMurray, Grande Prairie, Camrose, Lloydminster, Wetaskiwin, Banff, agus Jasper. Ó 24 Bealtaine, 2015, is í Rachel Notley, NDP, príomh-aire an chúige. Tá Alberta ainmnithe in ómós don bhanphrionsa "Louise Caroline Alberta" (1848–1939), ceathrú hiníon Victoria. Bean chéile Marquess Lorne, Seanascal Cheanada ó 1878 go 1883, ab ea í. Tá Loch Louise, sráidbhaile Caroline, agus sliabh Alberta ainmnithe in ómós di freisin. Ba C$311.898 bn. an olltáirgeacht intíre (OTI) a bhí ag Alberta sa bhliain 2012. Tugadh an leathanach seo cothrom le dáta an 4 Feabhra 2019 ag 04:10.